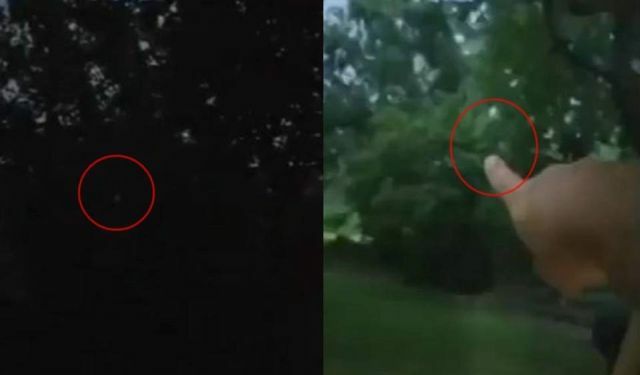 On April 27, 2018 Dal V noticed during a storm a strange light at the edge of his yard where the woods start, he points several times to the location where he saw the light. He said it looked like dripping melting plastic but here's nothing there except trees and the next day nothing unusual. During the recording of the phenomenon step by step he freaks out as he clearly see something what he cannot explain. Footage during a storm, limited light, the woods are dark. Dal could have imagined the Easter Bunny in his yard with a flashlight looking for carrots. I viewed this image several times, nothing remotely looks like "melting plastic". Atmospheric conditions can cause a variety of illusions, playing tricks with the eyes. Sorry, Dal, not this time.